It’s so hard to find the best tools that will HELP you with your blog. There are so many opinions out there. But as someone who has been blogging for 5 years, I think I’ve found my groove on what works. When I first started my blog I was totally lost and just trying out what works. So, I’ve decided to put together my favorite tools, programs, plugins and more that will help you with your blog. Today, I’m hitting you up with my all time favorites that will help you grow your blog and keep you sane. Creative Market – This is where I buy all my fonts, graphics, designs, stock photos. Basically, if I can’t create something on my blog, I turn to Creative Market. They are always coming out with monthly bundles that include multiple fonts, designs, and graphics for insane prices. I usually check out Creative Market at least once a week to see what’s been newly added. Lightroom – I edit all of my photos in Lightroom. Every. Single. One. It’s the best way to edit and really bring your photos to life. You can see how I edit here and you can also check out the presets I sell right here! PhotoShop – I love PhotoShop. I used to think I couldn’t learn it or that it was too expensive. I was wrong on both counts. If you learn some basics, you can learn Photoshop (I offer a quick Photoshop tutorial inside Blog Boss Babe!). It’s also only $10 a month. You can’t say no to that! Flip Clock for Mac – I’m not exactly sure what category this would fall under, but I get asked ALL the time how to get the flip clock I use on my Macbook. It’s from a site called Fliqlo – be aware it’s not the easiest so install but it’s super easy once you’re done. Genesis – One of the all time most popular frameworks for WordPress. It’s extremely powerful and it’s what I currently use on my blog. One of the best reasons are because Genesis offers dedicated plugins. These help me manage my blog and make it really easy to create a blog I like, on my own terms. Highly recommend if you’re on a WordPress blog. 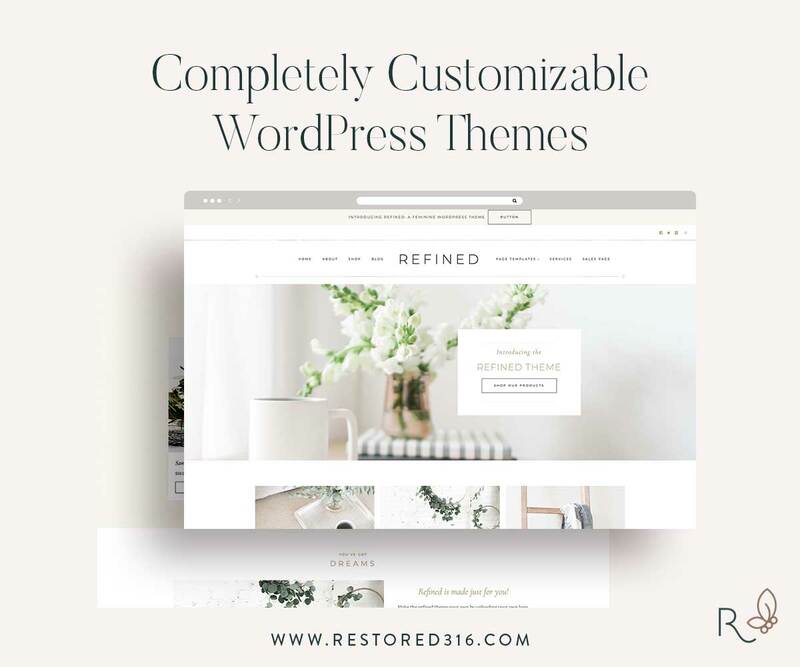 Restored 316 – This is the theme I use with my Genesis Framework for my WordPress blog. They have insanely beautiful and simple designs. Like the one I have right now! ThemeForest – I LOVE the designs and themes that Themeforest has. You really can’t go wrong with the beautiful, responsive theme. My first theme on WordPress was called Capri and was so easy to manipulate. Social & Chic – If you’re looking for designs for your Blogger blog then look no further. There are so many good options that work seamlessly. Colorful and clean designs that look very professional and fun. Etsy – If you are still searching, check out Etsy in general for blog designs. Whether you need a designs for Squarespace, WordPress, or Blogger, they have something that you’ll like or can make your own. Remember, you can always add a bit of coding on your own to make it work for you. 99 Designs – If you want a customized logo or blog design or really ANYTHING I am in LOVE with 99 deigns. They designed my current logo and it’s such a fun and unique process. First, it’s a better price than many high end designers. Simply put in what you’re looking for in terms of designs. Then, you’ll get feedback and ideas from dozens of designers and be able to tell what you like and don’t like. Then you’ll pick your top 3 favorites and have them come up with their best. Then you choose your winning design. I adore this because you get so many options all for a low price. Creative Market is also a great place to find designs and graphics. There are also themes to find here too. Convertkit – When I first started a blog, I thought I didn’t need an email list. But think of it this way, how many people visit your blog, and then disappear forever and ever? We don’t want that. Since implementing an email list I’ve increased page views and quadrupled my revenue. Plus, I’m able to establish a great connection with others online. Convertkit is an email marketing system FOR BLOGGERS. This is huge. It’s so easy to use. In fact, I show you how right here. Leadpages – I use Leadpages to collect all of my email subscribers. They create beautiful opt-in forms. But it doesn’t just stop there- you can do this with anything! I use it for my webinars as well- to collect email addresses, send to a thank you page, and even host the webinar. How cool is that?! This is by far one of my favorite blogging tools. Broken Link Checker – If you ever transfer your blog, make sure your links aren’t broken. If you’re like me, you aren’t going to check 1,000s of links. Broken link checker does it for you! WordPress Map Plugin – If you want to create an interactive map that shows where you’ve been along with dedicated links, this is the best map out there. There is a paid and free version! The free only allows for one map, but many just need one. Yoast SEO – Y’all know SEO is so important for Bloggers to get discovered online. You didn’t?! It’s okay, read this post then on SEO. My second biggest traffic source is Google, which I can attribute directly to SEO. Yoast helps keep me on task with SEO and it makes it very very easy. Essential Grid – This is probably the coolest plugin ever. It creates a grid out of your posts without having to add any messy code. It’s what I use in my Resource collection and makes it very easy to link documents or PDFs. POWr – YOU GUYS this is the coolest site. I use POWr to embed maps in my blog, the PDFs for Blog Boss Babe and so much more. It’s also only $2.99 a month. Basically it’s a really cool that allows you to do all kinds of fun stuff. They have all different options for embedding in your blog – no matter what platform you use. Blue Yeti Microphone – This makes a world of difference if you ever intend to record your voice or video. The sound is incomparable. Highly recommend, and it gets really small, so you can travel to say, Germany with it. Hisy Remote – This is the remote I use to take hands free photos with my smart phone. It’s small enough to throw in your purse and works so fast. I recommend everyone have this on hand. Hootsuite – When it comes to scheduling for your blog posts on social media, you should be doing SOMETHING. It saves so so so much time, effort, and energy. There is not a day that goes by that I don’t use a scheduling tool. It makes my life so much easier. Hootsuite is free. I do use the upgraded version but you can try it out and see if it works for you. SumoMe – You see those Pink Sharing buttons on the side of this post? That’s from SumoMe. It tracks and encourages shares on my blog posts. As simple and as effective as that. Highly recommend! Social Warfare – these are the plugins I am currently using on my blog and they are seamless. There is a price to use these but I just think they tend to work the best and look more elegant. TailWind – As for an all around Pinterest tool, TailWind is hands down my favorite. To put it simply, Tailwind is a Pinterest scheduling tool that makes my life at least a BILLION times easier. I can schedule pins on all different boards, at different times, in the future, or whenever I like. There’s also options to monitor and track my pins, schedule pins for the future, create board lists (this is my favorite thing to do) and create a Pinterest Schedule. Here’s entire post on how it changes the Pinterest game and how to use it. AND how to go viral on Pinterest with Tailwind Tribes. WP Help – I cannot sing the praises more about WP Help. I sincerely believe that if you’re on WordPress, you should be using WP Help. If you ever have a question, issue, or a problem arises, they are there to help answer it, solve it, and then show you what to do so it never happens again. My site was loading slowly and he emailed a detailed report of why, and then HE fixed it. This is my best purchase of 2016. Use code “HELENE-WP” here to save 25%. SiteGround – I adore SiteGround for web hosting. This is some of the best customer service out there. You just can’t beat it. It’s extremely reliable and they send me weekly updates about mu site. They also automatically back up my site (UM HI!) and I know that if there is any problem I can email support 24-7! BlueHost – I like BlueHost for web hosting as well. I don’t use it on Helene in Between but it’s a very reliable provider and they are going to be the cheaper option for most bloggers. This is a great option if you don’t have TONS of traffic and don’t need tons of support. I use ALL of the above on my blog, for real. So you know this is the real deal. Now, you tell me, What are some of your must have resources, tools, plugins, or programs for your blog?